07/09 - FEATURE - Matt Buskell/Skillsoft - Preventing Industry 4.0 failure: it’s all about cultural change - How can we upskill the workforce of the future so that they can use new AI technologies to augment their roles or explore more creative approaches? 28/08 - FEATURE - James Wood/Aptean - Manufacturers’ first step towards Industry 4.0 success - Could fear of failure be preventing Industry 4.0 technology from reaching the factory floor? 30/10 - NEWS - 'Fourth Industrial Revolution' could unlock billions for the UK - Embracing Industry 4.0 technologies could be key to major new benefits, report claims..
To view all of our Industry 4.0 content, click here. Technology has played a major role in advancing most areas of our everyday lives - but it can also have a significant effect in the world of industry. Originally proposed by the German government back in 2013, Industry 4.0 is the label given to the gradual combination of traditional manufacturing and industrial practices with the increasingly technological world around us. Traditionally a hotbed of innovation, the industrial sector is poised to benefit hugely from the next generation of technological breakthroughs, utilising the latest advances to improve efficiency and productivity via Industry 4.0.. In Industry 4.0, the connected ecosystem of the Internet of Things (IoT), will be able to help manufacturers and consumers alike to provide increased automation, improved communication and monitoring, along with self-diagnosis and new levels of analysis to provide a truly productive future. Factories will become increasingly automated and self-monitoring as the machines within are given the ability to analyse and communicate with each other and their human co-workers, granting companies much smoother processes that free up workers for other tasks. Why Industry 4.0? What happened to Industry 2.0 and 3.0? Most of us will have heard of the Industrial Revolution, when the adoption of new manufacturing techniques, including steam power and innovative machinery in the late eighteenth century had a major impact on employment, economic output and living standards. However perhaps less well known, is the idea that there have been two subsequent industrial revolutions. The Second Industrial Revolution is generally considered to have occurred between 1870 and the First World War and was marked by large-scale iron and steel production. The Third Industrial Revolution occurred much more recently, at some point between the late 1950s and 1970s, and concerns the adoption of digital technologies including mobile phones, computers and the Internet. Now, thanks to the continued pace of innovation and development, we stand on the cusp of the Fourth Industrial Revolution, also known as Industry 4.0. What does Industry 4.0 entail? Businesses, of course, are keeping a close eye on Industry 4.0 and what it could mean for their particular way of working. Previous industrial revolutions brought huge opportunity, but also a great number of challenges, as organisations and workers alike had to adapt their habits to cope with a fast-changing and evolving industrial environment. Industry 4.0 isn’t only being driven by the Internet of Things, however. Machine learning, artificial intelligence and big data analytics are all expected to contribute towards significant industry change. In addition, cloud computing will continue to play a vital role, ensuring that industries can access and store their information remotely. The development of network technology is also crucial for Industry 4.0 as any insights and efficiencies generated by IoT devices are only useful if they can be easily and quickly accessed. When will Industry 4.0 arrive? In many ways, Industry 4.0 is here already. The increasing growth and expansion of the Internet of Things (IoT) has led to much of the world becoming smarter and more connected, and led to major advances across a wide number of industries. Many businesses are embracing a wide number of connected technologies as they look to modernise and improve their work processes. 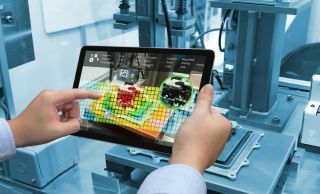 As mentioned above, Germany has been one of the major proponents of Industry 4.0, with local heavyweights such as Siemens and Volkswagen investing heavily into the area. Companies across the world are now working hard to ensure their processes are becoming smarter and more efficient, and the benefits of improved technological integration become clear, and this level will only increase as time goes by. What are some of the challenges of Industry 4.0? If businesses want to ensure that they benefit from Industry 4.0 they must be prepared to overcome some significant challenges. Firstly, security issues will arise as more and more devices becomes connected to the Internet. Every new access point is another potential vulnerability, so organisations must ensure that their security systems are suitably robust before adopting the Internet of Things. Security regulations will also have to adjust to Industry 4.0, particularly given the amount of sensitive information that could soon be accessed over a network connection. As well as security, network reliability will also provide a stern challenge for businesses. The productivity advantages of Industry 4.0 can only be realised if machine-to-machine (M2M) communication is fast and reliable. The added number of connected devices will place increased strain on organisations’ network infrastructure and also push national governments into ensuring their Internet speeds are up to scratch. Challenges of a human nature also exist around Industry 4.0 alongside these technical issues. Businesses will need to ensure that their members of staff have the necessary skills required to cope with new technologies and ways of working. Moreover, getting employees to embrace the Internet of Things, or Industry 4.0, may be a challenge, as it is sometimes associated with widespread disruption and mass redundancies. In reality, if businesses invest in re-training programmes and staff show a willingness to embrace change, Industry 4.0 is likely to be a net creator of jobs, but businesses may still find that change is met with some resistance. For businesses looking at Industry 4.0 with some trepidation, it is important to remember that every major industrial overhaul has been accompanied by both successes and failures. Instead of fearing Industry 4.0, businesses must embrace the coming change, having first undertaken the necessary planning and preparation. Be transparent with your employees and customers about the likely effects and possible disruption that could occur, because after all, the Fourth Industrial Revolution will see the merging of the real and the virtual worlds and could make an even bigger impact than the previous three.